Home » Aspiring for more! 33 year old Sharanappa Biradhar is a resident of Bidhar district in North Karnataka. He lost his eyesight when he was 3 years old. His parents were poor and unaware of ways to educate a blind child. But fortunately one of their relatives was a teacher in a blind school and informed them about it. 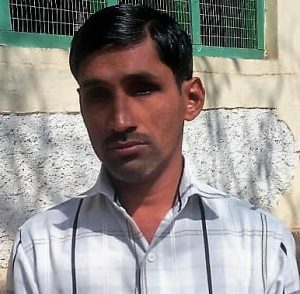 At the age of 6, Sharanappa was sent to a government school for blind boys in Gulbarga where he studied till Class Xth. He completed his further studies from regular college including a B Ed. degree as he was interested in taking up a teaching job. In addition, Sharanappa also pursued a Diploma in Education from a training center for the visually impaired. While he was studying, he got married to a sighted girl, who was also a graduate in B. Ed and supported him to study further. He cleared his KPSC entrance exam and got a job as First Division Assistant in the Forest Department where he worked for 2 years. Recently he appeared for competitive exams for teaching, as he wanted to be a teacher and got selected as a History teacher in a government school in Raichur district. For someone who is visually impaired, Sharanappa seems to be well-informed and ambitious. He uses braille for teaching as well was to access his reference notes. As a regular listener to EnAble India’s audio service, Namma Vaani for disabled people in that region, Sharanappa came across the Eyeway toll free helpline number and called us for some of his queries. He wanted to apply for a UDID card but was unaware of the procedure. Eyeway counselor guided him through the entire application process. During the course of calls our counselor realized that even though he was educated and somewhat aware, Sharanappa lacked information regarding some easily available assistive technology to help him with daily needs. The counselor apprised him of various mobile apps, talk back feature on android phones, demonstrating to him how he could use all these tools to read the newspaper, navigate to a location independently, scanning documents and so on. Sharanappa realized all this could also prove helpful in improving his teaching methods. He showed a keen interest to attend a training programme at EnAble India to gain proper know-how about assistive technology. Sharanappa can be an inspiration for many because in spite of living in a rural area and being 100% visually impaired he is educated, well aware and ambitious.